For this recognition, the Board of Education represents public, non-public, traditional, charter and magnet schools in 44 different states, all of which prove that diversity shows that excellence isn’t limited to certain students or neighborhoods. More importantly, the selected National Blue Ribbon Schools demonstrate that challenges of all kinds can be overcome. Deer Canyon Elementary School is located in the community of Rancho Penasquitos and is led by Principal Terry Worthington and an amazing administrative staff. Principal Worthington has been a part of the Deer Canyon Elementary School family for 8 years. When asked how Deer Canyon celebrated being named as a 2015 National Blue Ribbon School, Worthington said “We have shared our good news through our local newsletter, Echoes and a morning announcement when the initial announcement was made. We celebrated at our First Flag school-wide assembly in November and were recognized by the County Board of Education at their November meeting.” Worthington also stated that they now can proudly fly the National Blue Ribbon Award flag in front of their school each day along with a special plaque on the schools’ front door. Deer Canyon Elementary School is home to an exceptional group of students, staff and parents who are committed to ensuring the highest academic rigor, social emotional development and education of the total child. “We are fortunate to have a number of Foundation funded programs on campus, including PE, Art, Science and Music. Our PTA provides family programs, enrichment activities and special events for our community and school.” Having such a supportive staff and tight knit community has given Deer Canyon the opportunity to live up to their mission each day, that being to ensure all students develop a love of learning and become highly successfully in not only school, but in society and the work place. The students and staff of Deer Canyon like to have their fun too! Thanks to the PTA, Foundation and an incredible amount of parent volunteers, each spring the schools hosts a Health Expo led by local community members and high school students where the children take part in a variety of activities that promote their health and well-being. But that’s most certainly not all. “Every year, fifth grade students are invited to join the Ride Across California, a tradition that originated at our school 25 years ago. During this event, students spend a week riding bicycles from the Arizona border to the California coast.” Other annual events include Family Fun Night at the end of the year, Lego Robotics, Lego Robotics, Jr., and Math Olympiad. The list seems to be endless! 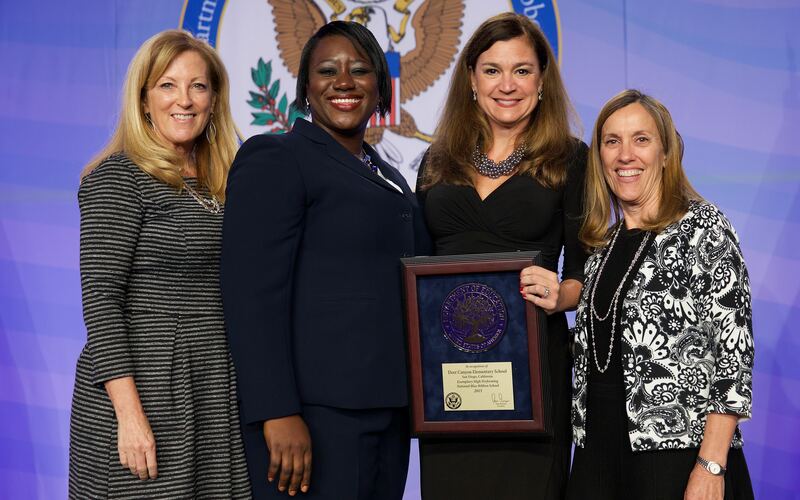 The U.S. Board of Education encourages each school named as a National Blue Ribbon School to share what they know in order to educate other schools to execute the best type of practices, the value of involving community members and families in the students’ learning process, the importance of college and career readiness and so much more. These types of educational processes and systems that the 332 schools partake in on a daily basis have led them to become such an inspiration to schools and educational organizations everywhere. Congratulations to the staff, students and families of Deer Canyon Elementary! Your hard work and determination is truly inspiring and appreciated by our community.